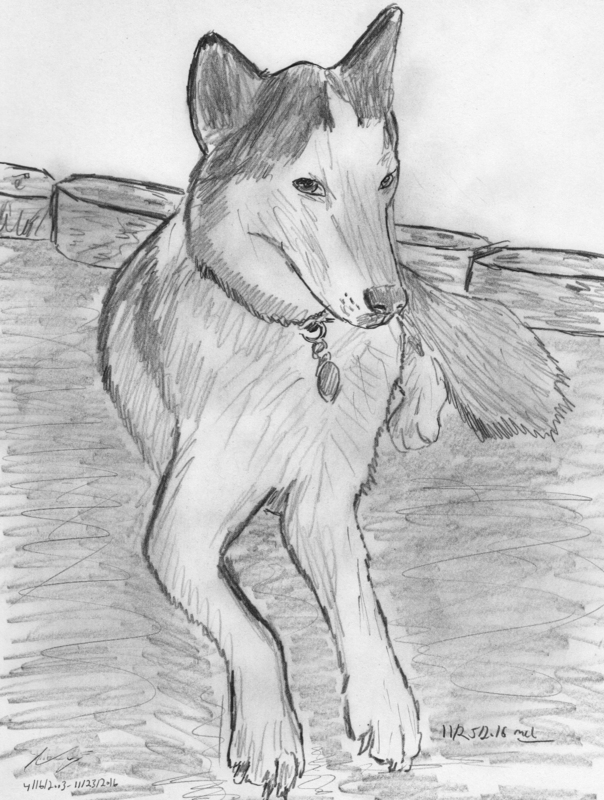 Isis, my husky, joined the pack in 2004. She was a year old and her soul was filled with a wildness and a love of destruction. I channeled that wildness into running and that (mostly) took care of her love of destruction as well. We ran together for years, until she could no longer run. Then we walked on our adventures—a stately saunter rather than a mad dash. One day in March, 2016 she collapsed and I thought that was the end. But steroids granted her a reprieve and our adventures continued. But, time ends all things. As the months went by, she hit a plateau of recovery and then began a decline. She could not walk as far, she had to be supported while doing her business and she was sometimes confused about where she was. This worsened as November progressed—she required ever more support, walked ever less distance, and had trouble distinguishing between the outside and inside of the house. Since she was my dog and I was her human, I accepted all this. I stocked up on carpet cleaner and ran the steam cleaner regularly. Since she could not handle the smooth floors, I put down yoga mats for her—I had tried carpet runners, but they drink up the urine. Yoga mats can be hosed off, dried and put back in place. Though she suffered a physical and mental decline, her will remained unimpaired. When she decided that she wanted to walk someplace, she would struggle with her weakened legs and force her way through vegetation and up hills. If she could not make it up a hill on her own, she would turn her head to look at me and would not move again until I supported her and allowed her to power up that hill. She had the spirit of a true runner; never giving up in the face of a challenge. In the face of time, however, will and love are not enough. She suffered a sudden decline and completely lost her ability to walk. I would carry her to do her business, but even with my support she had great difficulty. On November 22, things got even worse and neither of us slept that night. I wanted her to make it through Thanksgiving (she loved turkey), but on the morning of the 23rd I saw the pain in her eyes and knew what had to be done. Courtney, a friend of mine from Maine, had sent us some Christmas dog bones and a dog toy. I unwrapped those and hand fed her, placing the toy between her paws. After we had our early Christmas, I carried her to the truck and drove to Oakwood Animal Hospital. While no one really knows what is in the heart of another, I could tell that she had absolute trust in me as I carried her into the office. She knew that I would, as I have always done, do the right thing for her. Her regular vet was on duty and, after we talked, Isis was put on an IV. As the vet, vet tech and I comforted her and cried, she passed away gently and peacefully. This was the hardest decision of my life, choosing the death of my friend. Since I teach ethics, I have thought a great deal about this sort of decision. But, the theoretical context of the classroom is rather different from the harsh reality of deciding whether your friend should keep living. While some doubt the use of philosophy, thinking about this matter proved to be very helpful and even comforting in making the decision. While people are said to own dogs, I never saw our relationship as matter of owning property. Rather, we had reached a mutual understanding and formed a team. Huskies are supervillains when it comes to escape, so they can (and do) end their relationships with humans when they wish. By accepting her, I took on many moral responsibilities. Some of these are analogous to those to my human friends, others are more analogous to those of a parent to a child. These included the usual obligations of keeping her healthy and safe; but they also included the obligation to ensure her wellbeing and happiness. When she collapsed in March, I had to make the decision whether to try treatment or let her go then. While she was suffering, the medical evidence indicated that she had a chance to recover. Knowing her stubborn will, I believed that she would want to take that chance and power through the pain. I could not be certain of what she wanted; but I went with what I thought she would want. It turned out it was the right call; she recovered and returned to enjoying life. As I got to know her, I learned that she had a look that meant “I need you to do something for me.” In the past, this usually meant playing with her, getting her a snack or letting her into the backyard to menace the lesser creatures (to a husky, almost all other creatures are lesser). These things made her happy, and I was pleased to oblige—after all, I had a moral responsibility to her wellbeing because she was my dog and I was her human. When she had declined to her worst, she stared at me intently with that look. Since she could not talk, she could not say what she wanted. She, I believed, wanted an end to her pain. I might just think that to feel better about my decision—perhaps she was doing nothing of the sort. But, I knew that to keep her alive and suffering would not be to act for her wellbeing or happiness. Medicine is quite good these days; I probably could have kept her going a few months more with painkillers and other medications. But that would be a dull and drugged life, not a life suitable for a soul so full of wildness and a love of destruction. I wanted her to end as my beloved wolf and not dissipate to nothing in a sea of pharmaceuticals. So, I said goodbye to my good girl.